Hello Ladies~! (≧∇≦)/ Now I want to make a famous color lens in Japan, Bambi Brown/ Princess mimi brown which is sponsored by GalLover. Gal Lover sell many contact lens from many brand like Barbie Eye, Geo, Candy Magic and other brands with many design and style that you can choose! GalLover kindly sent me 1 pair of Geo Princess Mimi Brown which known as Bambi Series and designed by Tsubasa Masuwaka. 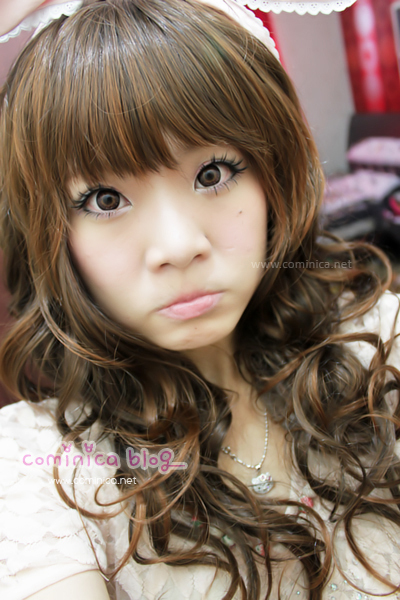 I'm so happy when received this contact lens yesterday, this contact lens is really really pretty!! I love the red tone in the brown color and the design. I always love 3 tone color lens because it makes my eyes make up look bolder and obvious. ☆ make my eyes big! eyelash lg leeeen? ehehehe..addictive bgt neh brg yaa..
suka sama lensnya! tapi mahal yah bu klo order dari sono 35$. if you want you can visit my blog. comment please!! I've seen this in a lot of online lens stores now...and I really want to try it! x) The pattern is really cute. These look very pretty on you. On me, they looked really creepy!